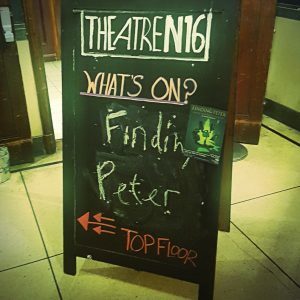 Finding Peter at the Theatre N16 was listed as a childrens show in a small theatre, so I went to check it out. It is billed as a sequel to Peter Pan, written by Frankie Meredith. The small theatre room is sparseley decorated as a small attic bedroom and the children in the audience sit on cushions on the floor, while the adults get some chairs behind the row of cushions. The three Darling children are dressed in their pajamas, it is time for bed, but Michael and John don’t want to sleep just yet, so their older sister Wendy spins a tale that takes them back to Neverland. Wendy, played by Jenny Wilford, enthusiactically encourages the children in the audience to imagine their journey to Neverland, sprinkling glitter into their hands and asking everyone to close our eyes and count to three. After this short introduction, we are swept into a fantasy land of mermaids, pirates, warriors and of course the lost boys. The stage and costumes barely change at all, but our imaginations are fired into action by the vivid descriptions of the actors. 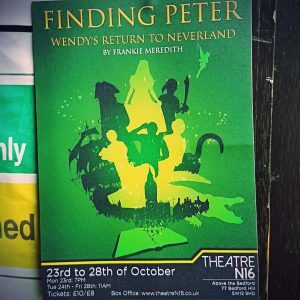 Alastair Michael and Olivia Bernstone do not just play Wendy’s brother, but also a plethora of other characters chasing through Neverland alongside Tinkerbell to try to find Peter Pan. 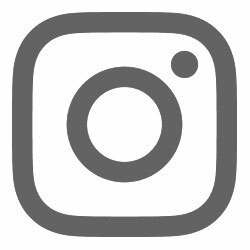 While all three actors throw themselves fully into the story and manage to paint a vivid picture, not all of the young chidren are able to follow the quick succession of character and scenery changes. Some of the older ones are very engaged, answering loudly to questions posed by Wendy and singing along to silly tunes, but the younger ones seem a bit lost. Yet all three actors manage to stay enthusiastic and focussed, radiating joy. The story is very short, at about 40 minutes still shorter than the advertised run time of 45 minutes, which is too bad as the play seems to try to achieve too much in so little time. It’s definitely very entertaining for the children and the actors gave their all, but the story falls a bit short and could use a little more detail and cohesion rather than trying to fill it with as many mythical characters as possible. I enjoyed it and would recommend it to families with children 4-6 yrs old, but hope the author considers adding a bit more to the play to flesh it out more. Three out of six rainbow sloths.